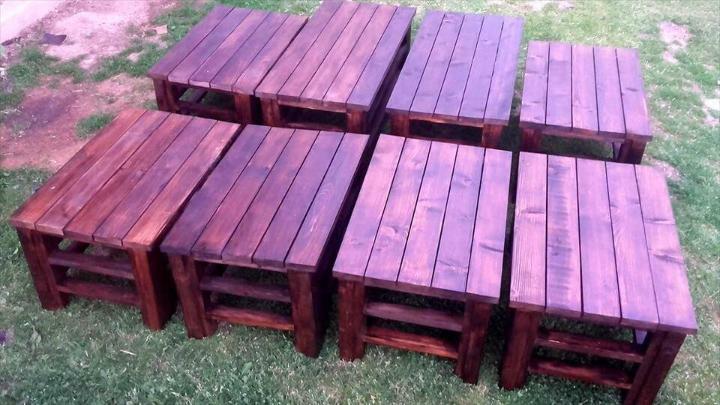 101 Unique Pallet Furniture Ideas, Pallet Projects and Much from Pallets. 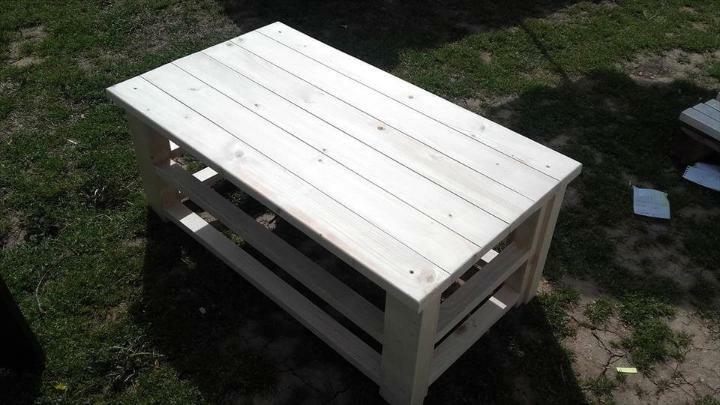 With pallets, there are a lot of possibilities to shape up a pallet coffee table of your own desire and need with all the features you wanted to see in it. 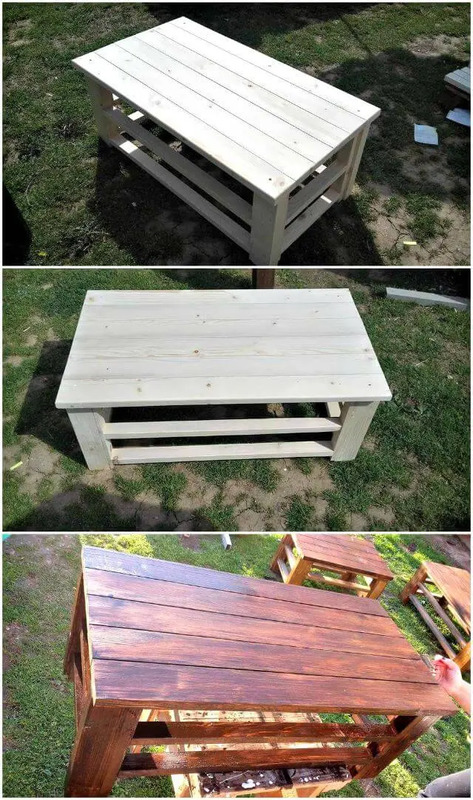 And you would find a lot of pallet ideas to install a coffee table in various styles and designs on these DIY pallet projects and even today we are with something that would interest you a lot. 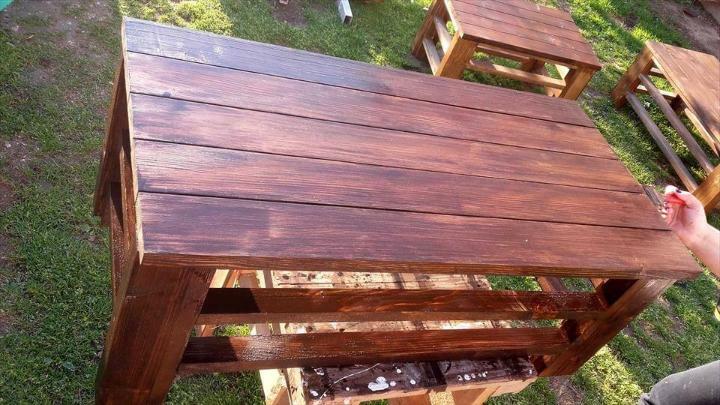 So check out this DIY wooden pallet coffee tables which has been very simply yet nicely built from the pallet slat pieces to form the plain and wide table top and the sturdy four legs. All you would need to do is just cut some pallet slats of customizing size from the pallets and then stack them together using nails and wooden glue. Either small or big coffee table depends on your needs and demands so keep in mind the measure of slats while cutting.. The fun thing about the coffee table here is its multi possible stain finishes in brown, purple and white to make it a part of traditional, shabby chic and contemporary décor respectively. The coffee table in the above picture is the simple styled and designed coffee table made from the recycling pallets so that you enjoy a decent piece of coffee table which is really easy and feasible to build also. The coffee table has been built very nicely from the pallet slat pieces having been cut out of the pallets large and wide in size and then these slats have been stacked together to shape up the table atop and the leggy support. The above coffee table was given an elegant white finish but if you are a lover of striking hues then you can give the coffee table this attractive purple shade to make it an eyeful piece in the house decor. But if you are a lover of traditional theme in the decor and furnishing of the house then the only option to make the table stained or finish is this brown shade having been done so nicely after sanding it down smooth. 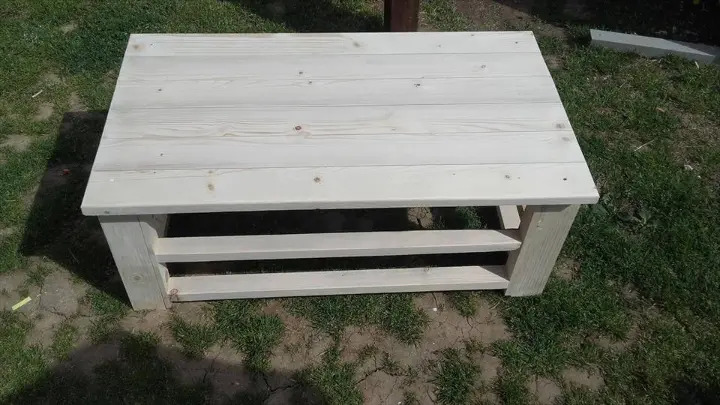 The best thing about the pallet made coffee table is that you can make a coffee table of custom size depending on your needs and desires as this one coffee table has been been in two options to be build in small or large size. Pallets come as a great shipping wood waste and are destined mostly to landfill areas! We are going on an adventure to save the pallets from someone’s stove or from just being wasted for nothing! Join us to reduce this pallet wood waste through recycling and also to build the cost-effective pallet furniture pieces you are always in search of! Our aim is to share the DIY pallet ideas and ways here to get the pallets back in functional and serviceable conditions! Get mind-blowing pallet projects here to reclaim, upcycle and recycle the pallets in order to make them live more with you! 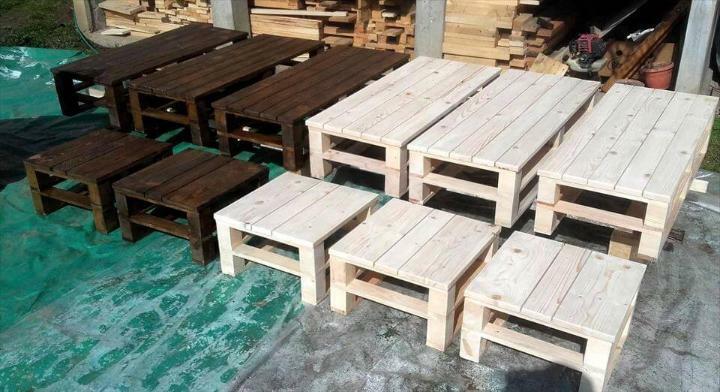 By recycling the pallets, one can not only improve his living but can also take part in wood waste reduction! So join us and Share your Pallet Projects.